Pedal pump and fist bump— A new fitness fad is storming spinning classes, across the U.S. Cycling instructors are now syncing their music to a live in-studio DJ. 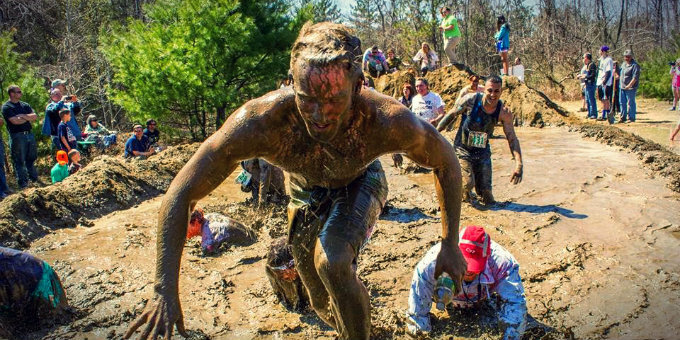 The popularization of the trend is transforming stale fitness classes. Among the programs cropping up, is the Pittsburgh-based studio, Club Cycle. The venue specializes in soundtrack infused cycling sessions, and each class is categorized by theme, from “80’s vs. 90’s” to “Miley Cyrus vs. Demi Lovato.” The studio offers thirty classes; each showcases music of a distinct era, genre or artist. The sessions range from 45-minutes to an hour and spaces are booked by the bike. Upon creating an account, you are shown a layout of the studio including each bikes location in the room. You can then choose whether they’d prefer to sit in the front or back at the session. Just like the succinct musical accompaniment, the studio measures your progress meticulously. An average 45-minute session burns about 500 calories but that calculation is perfected after attending a session. 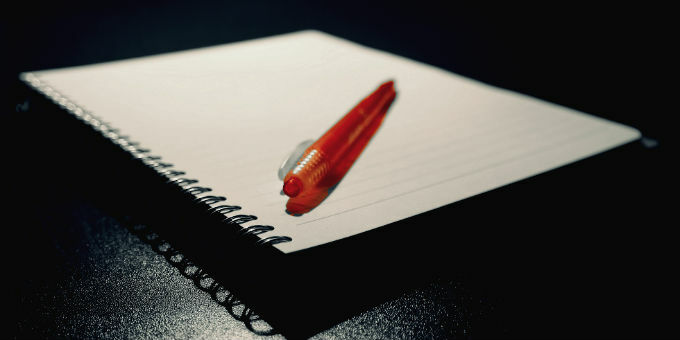 After completing a class, you are sent a list statistics including calorie counts, blood pressure and efforts during the class. These metrics are compiled into a timeline of your performance at each session. 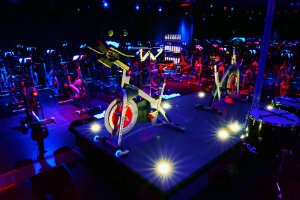 While Club Cycle is a product of the latest trend, other gyms are looking to revamp their existing spin cycle. NRG Fitness, a gym in Fort Lauderdale, FL, gave the trend a spin, according to a report in the Sunday Sentinel. After a nationwide tour of spinning classes, NRG Fitness owner, Peter Ware, decided to turn the lights down on his night classes. 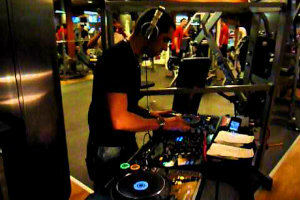 After outfitting a booth with nightclub acoustics, Ware flashed the gym’s 120-inch televisions to the beat. Ware’s gym now features nightly spinning sessions, Monday through Thursday. The Chicago Athletic Clubs’ spin studio resembles a nightclub more than it does a fitness center. Based on report by Chicago Athlete Magazine, the black lights and speakers give the ambiance of a night on the town. Cycling instructor Mandee Miller, not only calls the intervals she collaborates closely with the DJ to control the music. This makes for a specialized approach. She gauges the speed of each class based on the group’s endurance and fitness expertise. 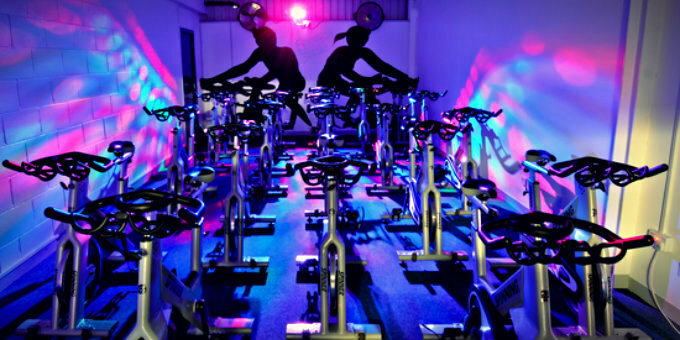 Fresh on the fitness scene, the average spinning class is about to get a lot more interesting. 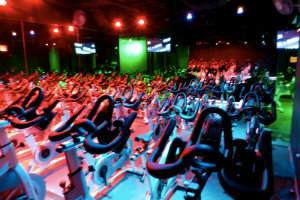 Or (better yet) nightclubs will begin investing in some stationary bikes. Either way— get to pedaling.